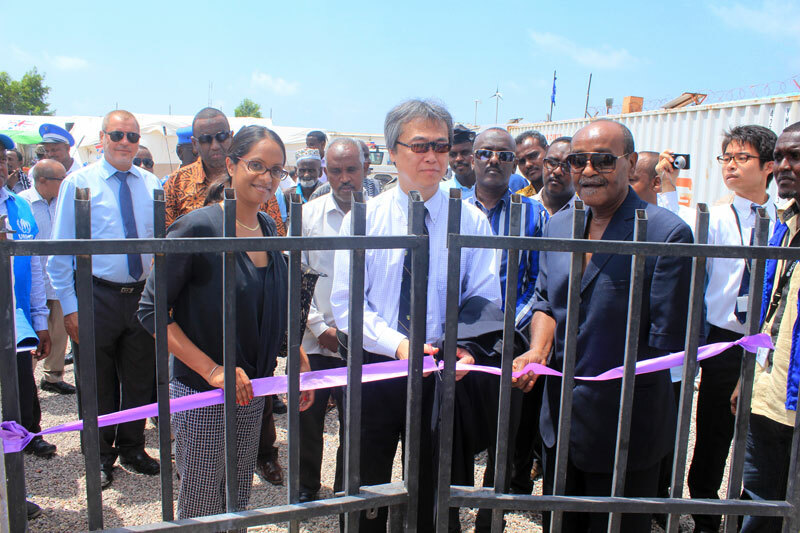 Djibouti - Created in 2011, the Migration Response Center (MRC) in Obock, Djibouti, has been rehabilitated with the support of the Government of Japan. New premises including shelters for women and Unaccompanied Minor Children (UMCs) and Water, Sanitation and Hygiene (WASH) facilities have been added to the previously existing structures. The center directly managed by IOM hosts around 5,000 migrants annually as part of evacuation and voluntary return programs. The inauguration ceremony of the new premises of the MRC was held on Thursday, 30 March 2017. This ceremony was attended by Djibouti’s Minister of the Interior, Hassan Omar Mohamed, the Ambassador of Japan, Tatsuo Arai, the prefect of Obock Region, Hassan Dabaleh, and the Chief of Mission of IOM Djibouti, Lalini Veerassamy. “Obock will remain a strategic transit point for migrants seeking for better opportunities in the Gulf Council Countries. With the increased trend – noted in spite of the Yemen crisis – it was important that IOM strengthens its capacity at the Migration Response Center for increased protection to these vulnerable migrants, with a high prevalence of Unaccompanied Minor Children,” said the Chief of Mission of IOM Djibouti. The rehabilitation of the center was funded by the Government of Japan through the project “Strengthen Security in Djibouti and Safety of Migrants through Counter-trafficking, Marine Safety and Emergency Assistance”. IOM and the Ministry of the Interior have been cooperating since 2009 in strengthening responses to the challenges posed by migration issues in the region. The Agreement between the two entities on direct assistance to migrants and management of the MRC has been renewed early this year.